What’s the Benefits of Cavity Wall Insulation? Not only is effective cavity wall insulation good for your home, it is good for your pocket and good for the environment. Installing cavity wall insulation is probably the most effective energy saving step you can take. After all, 6 million home owners can’t be wrong! It is a widely know fact that up to 35% of heat loss in a home can be through the external walls. By installing insulation you will save on your heating costs for many years to come. Your carbon footprint will also be significantly reduced as a result, producing far less Carbon Dioxide. Around 5 million homes still have empty cavities that could have cavity wall insulation installed, allowing the occupants to enjoy a warmer and cheaper to heat house. Various Grants and schemes are available to help with the cost, so there really is no reason not to benefit. Get a free quote online to replace or install cavity wall insulation now. Most homes built since the 1920’s have cavity walls, i.e. an inner and an outer ‘skin’ with a gap between them. Filling this gap with insulation material improved the retention of heat on the inside of the property. Polystyrene beads are completely waterproof, so even if they do get wet, they will dry out without any lasting damage or adverse affect on your insulation. If your property was built after the 1920’s, you almost certainly have cavity walls. Older houses are more likely to have solid walls. Contact us today so we can check the condition of your current masonry or brickwork, and any existing insulation if it exists. 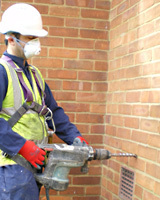 How Cavity Wall Insulation Is Installed? You’ll need a registered installer to fit cavity wall insulation – it’s not a job you can do yourself. The insulation material is injected through small holes drilled in the exterior brickwork. Once the installation is complete we make good all brickwork, blending in the installation work to retain the look of your property. 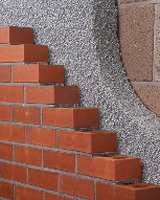 Cavity walls are filled with an insulating material; commonly-used materials include mineral wool, polystyrene beads or foam. Insulating cavity walls will help trap heat and prevent warmth from escaping. A typical installation usually takes less than half a day. The average cost of cavity wall insulation can be difficult to determine. We tend to price each job on an individual basis, as the scope of the required work can vary, especially as we take on jobs of any size. Although looking at data from the Energy Saving Trust you could save up to £275 a year by insulating cavity walls. Work out the potential savings for your property using the table below. Figures based on a typical gas-heated home. All data obtained from the Energy Saving Trust (EST).